Financial – Jim Brosnan reported a bank balance of $1594. Insurance for coming year is $575. Manager’s Minute: Brian Strasavich reported that the assistant park manager position is open as he has taken a position in the Palisades region. Pool reception and changing areas renovations are underway. Maria Adams reviewed the Code of Conduct which incorporated suggestions from the November meeting. It was adopted. 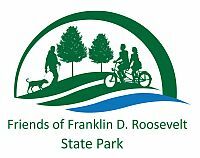 Jane Daniels has contacted Parks and Trails New York about making changes in capacity building grant we received from them. They approved our purchasing new rack card holders. Jane is to submit a request asking that the fee for the Yorktown Street Fair be charged to the grant. The draft goals for 2015 were revised to include a third goal of providing enhancements to the park. Examples include fish line disposal, a disc golf clinic, and making history of the park available on line and on kiosks in the park.